A magical venue - this venue has it all. Its secluded with its own organic farm, a huge choice of accommodation and two swimming pools - step over the wall and you are on the beach! There are three meals a day, plus a choice of teas and coffee all day long. La Gomera is one of the least known of the Canary Islands, it has a temperate climate and great tranquillity. A small island it is extremely popular with walkers because of the contrasting landscapes; the coastline dotted with villages, the mountainous core of misty rainforests, banana plantations and terraces. Our venue is is completely hidden along the cliff-face, in a secluded bay, ten minutes walk from the village of Vueletas. We are beside the ocean with a pebble beach. Behind the tropical garden the land has been transformed by permaculture gardening techniques into a lush and highly productive small organic farm with its own natural spring. The venue has two swimming pools, one smaller and sheltered for hiding away, and one full size for cooling swims in the heat of the day. 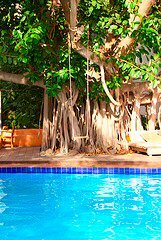 Relax in the shade of the two huge rubber trees - one holds a swing that sweeps the pool and one shades the upper deck overlooking the beach. Ten minutes walk away is the village, here are lots of cafes and small shops plus an air of calmness and old fashioned tourism. There are several long sandy beaches, a great cake shop and a home made ice cream parlour - try their 88% chocolate ice cream! For the energtic there are rainforest walks, dolphin boat rides, kayaking trips and mountain biking. Book these individually in the village or ask the office to arrange a group booking. Or just relax and spend your days basking in the sunshine on the lawns looking out to the balmy sea. 07.00 - 08.00 Meditation for the early risers! *Please note we cannot guarantee the daily availability of locally run classes. There is a range of accommodation. Staying within the tropical garden is amazing with the sounds of the birds and the frogs and your own garden area with table and chairs. Most standard rooms also overlook the garden and en-suite rooms and apartments face the ocean. For those students staying in the garden or the standard rooms there are four places to shower, one with one shower and one toilet, one with 2 showers and toilets and one with three showers and two toilets and one private shower and toilet. Please ask us if you wish to be very close to a shower/toilet - most rooms are close, however one summerhouse and also the A-frame are a little further away. A Frame and Pyramid - spacious and fully standing on wooden floor platforms with private verandas, garden table and chairs, set in the shade of the mango trees. They are fully equipped with a double bed, lighting, and clothes storage space. Summerhouse - spacious and set in the garden shade these are wooden 'houses' with verandas, a small garden area and garden table and chairs. Each has one double bed an one single bed, lighting and clothes storage space. Garden Rooms - A row of prettily decorated rooms along a shared shady veranda, with use of shared showers and bathrooms at either end. Quiet and comfortable, each room is simply designed and most have washbasins. Four rooms have twin beds and one room has a double bed. Room 5 does not face the garden and does not have a wash-basin. Please note: we normally do not use room 5 except by special request. En suite Rooms - A row of en suite rooms at the heart of the Finca facing the sea. Each has a small private balcony overlooking the tropical garden at rear (except for room 6 which has a private sea facing veranda). Each room is entered via patio doors from the communal sea view veranda. En suite Studio Apartments - Although officially on-site these are separate from the main venue and reached by walking around the perimeter. Just a few minutes walk up a small hill to the rear of the Finca, the studios are completely private. These 3 studio apartments come with their own private entrance and swimming pool that overlooks the sea, with stunning views.Like 'bed-sits' these studios each comprise of a patio with French windows behind which is a lounge area. Behind this is the bed area and behind this the kitchen area. The room is quite large, off of which there is a private bathroom. Food - During your stay, you will enjoy 3 superb organic vegetarian buffet meals per day, along with teas, coffee and spring water. An honesty bar operates from which you may purchase fruit drinks, beer and wine. Black tea, coffees, herb teas made from fresh herbs and drinking water are all provided free of charge 24 hours. Snacks are also put out between meals - although with 3 vegetarian meals a day you may not need these! On one day, usually Tuesday evening, we will eat out as the on-site restaurant is closed, this is not included in the cost of your holiday. On this evening if you don't want to go into the village to a restaurant you can raid the venue's fridge and cook yourself something in their kitchen. Includes - Accommodation, yoga, full board (except for one evening on the cooks night off when we eat out, this meal is not included in the cost of the holiday). Not Included - Flights, ferry, transfers, insurance and meal on chefs night off. Flights - Take a morning flight to Tenerife South. Transfers - make your way to Los Cristiannos ferry port (approx 15mins from airport) and then catch the ferry to San Sebastion. On arrival at San Sebastion you can take a taxi or the bus to Valle Gran Rey. (There will be a group transfer from the 14.00 ferry). All single supplements on application only. Belated thanks to you and Debbie for arranging the wonderful visit to La Gomera. I thought Yuva would be hard to match, but I think I now have two equally fantastic restorative locations! 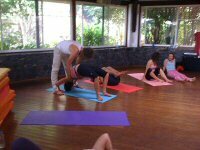 So I am back at work after 2.5 weeks holidays on La Gomera inclusive the Yoga week with Suzanna. Thanks a lot for all it was just great and Suzanna is a great teacher and a very nice person. Compliments from Switzerland for such nice team members. I just wanted to let you know that i had a wonderful holiday in Argayall. The place is a paradise and went well beyond my expectations. Ken's work is very different to anything i have done before and it was a great surprise to find out how it worked. I am sure I will be booking more holidays with you as soon as I can escape again. thank you very much for organising it. thanks for the super week! 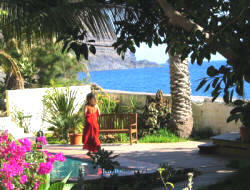 Just to say how much I enjoyed the May, David Sye Yoga holiday at La Gomera. Everything was great and as explained in your brochure, I would certainly go on another one of your holidays. The Finca was comfortable, fun and relaxing and the food was wonderful. Thanks Jilly...Yes great pics! A fabulous week so pleased I joined you all! I was very happy to get to know all of you and for sure will be part of another yoga holiday in the future! !